iPhone and iPad users have long wanted Nintendo games to come to the iOS platform, but thus far Nintendo has stayed away from releasing native games for any Apple hardware. 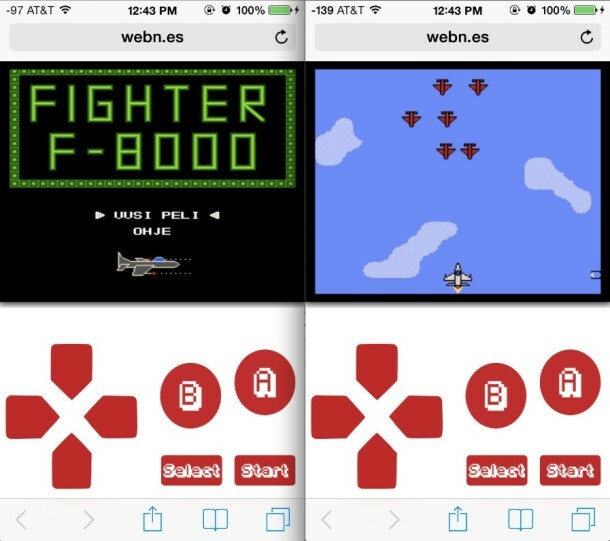 That hasn’t stopped enthusiasts from figuring out ways to play Nintendo classics on their iPhones though, which typically that entails jailbreaking a device then installing an emulator from the Cydia store, but WebNES is different. 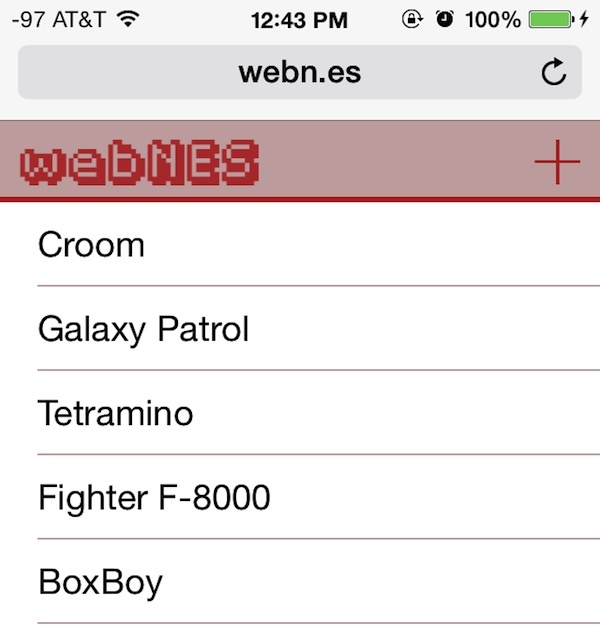 Instead of requiring any downloads, messing with jailbreaks, tweaks, or apps, WebNES runs entirely in the web browser as a full-fledged Nintendo emulator. That means there’s just about no setup required. It works surprisingly well on the iPhone, though it’s slightly laggy sometimes, and should work just as well on the iPad, iPod touch, or any Android too. (Sorry desktop OS X users, but you can use the excellent OpenEMU instead). The emulator loads rather quickly, with five games that are pre-bundled to choose from. Controls are built directly into the web emulator, with the simple four-way directional pad, A, B, Select, and Start buttons that work with taps. If you try to load the WebNES site in your desktop browser you’ll find it won’t work, but with the excellent emulator apps like OpenEMU available freely to desktop Mac users that shouldn’t be much of a problem. Having fun with WebNES? Bookmark it to your iOS home screen and it’ll be ready to play anytime you want some retro gaming action on the go. Nice concept! There are a few bugs, and no sound 99% of the time. Also a bit laggy. Was able to successfully load and play a few ROM’s, but with the lag, made it hard to play anything seriously. But it has great potential! It’s a nice alternative to emulation without Jailbreaking. Sound works if you use headphones or external speakers through AUX! Probably should have mentioned that in the article. 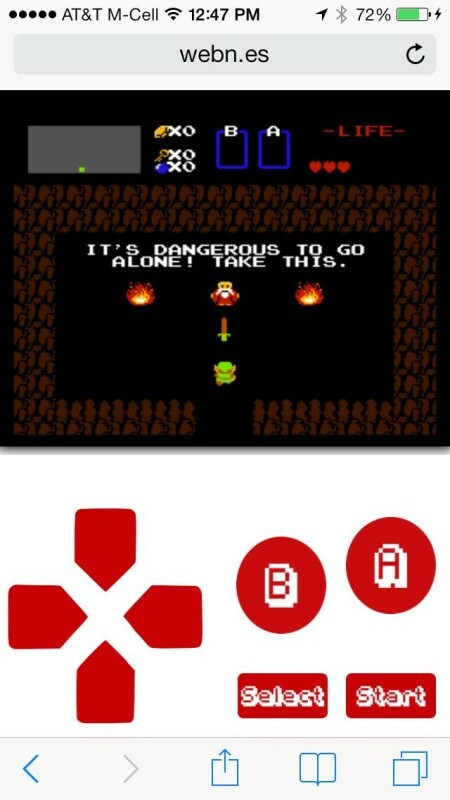 Probably not a good idea to condone (first) and advertise for (second) playing pirated and emulated games on your site. Just…not a good idea. Want to play NES games? Great! Nintendo happens to have hardware currently available at retail to play legitimate copies of these games. Don’t want to spend the money on a 3DS or Wii U? Fine. Go to a swap meet (or craigslist, or ebay, etc) and buy either a bona fide NES or one of the third party clones that will typically allow you to play games for NES, SNES, Genesis, etc all in one. The five bundled games are creative commons, not “pirated” and not under a copyright. Did you even bother to look at WebNES? They’re just a few games that are knock-offs of originals, Tetramino is similar to Tetris, etc. Anyway, there’s no issue with emulators. WEBNes only works online. That includes the bookmarked version. I’m going to be flying on Tuesday, does it work offline? can I still save? You can get Zelda NES on the Nintendo Switch or Nintendo Classic console, and the SNES Classic console also has Zelda Link to the Past. Great games, would highly recommend!